Coron’s scenic lagoons, charming beaches and wreck diving spots with amazing underwater biodiversity are the reasons why it’s one of the coolest places every beach lover or diving enthusiast should visit. With rich corals and variety of colorful fishes, it is truly a wonderful experience hopping from one spot to another. Before coming to Coron, we decided to buy a snorkel gear instead of renting a set that costs ~Php200 per day —anticipating that we can use it later on with the long list of snorkeling and diving spots we hope to visit someday. To Twin’s Lake’s first lagoon. Join the Coron Island Loop Tour and get to marvel at the poster-worthy scenes of Kayangan Lake and Twin Lagoon and frolic on fine sandy beaches. The Coron Loop Tour is an island-hopping activity via outrigger boat which consists of the following spots: Kayangan Lake, Siete Pecados, Twin Peaks, Vivian Beach, Twin Lagoon, CYC Beach, Coral Garden and possibly more (can include Baraccuda Lake for an extra fee). The highlights of this whole day boat tour are: Kayangan Lake, Twin Lagoon and Coral Gardens. To go to Kayangan Lake, you need to climb 150 steps up to the view deck and then another 150 steps down to the aquamarine lake. It is considered the cleanest lake in the country with impossibly clear waters. You can see clearly the very bottom. To get to Twin Lagoon (second lagoon), you either need to take the wooden ladders or swim through a small passage hole underneath a huge limestone. The hole passage gets smaller during high tide. We had so much fun here despite the rain shower. This captivating twin lagoon is divided by a huge limestone wall, and has deeper and darker waters compared to Kayangan Lake. It has contrasting water temperatures. Suddenly it turns warm from cool within less than a minute swim. This island hopping package already includes snorkeling gear rentals (but can be an additional fee) and a satisfying lunch prepared by the boatmen themselves while aboard. It is not an exclusive tour, so a solo traveler or other small group of tourists are welcome to join in the boat which can accommodate more or less 20 people. It starts by 8am at the wharf near Coron Public Market. Kayangan Lake. Cleanest lake in the country. Spend some time relaxing on white sand beaches around Calamian group of islands. Top picks are: Banana Island, Banul Beach, Bulog Dos Island, Beach 91, Vivian Beach and Malcapuya Island—where we saw a baby sting ray. You can just laze around at these scenic beaches, or go a little deeper with a snorkel gear and you’ll see many colorful fishes. After enjoying the whole day basking in the sun, it’s great to refresh at Maquinit Hot Spring. The place has a lovely and serene view during dusk. Before it gets totally dark when the sun is below the distant horizon, the surrounding seascape diffuses into predominantly blue hue. This is called the ‘blue hour‘. At the end of the wooden footbridge is a viewing deck for you to appreciate the placid bluish-gray briny waters and surrounding mangroves while waiting for the sun to hide. The calm and peaceful atmosphere makes you introspect on things troubling you, helping you release long-buried negative thoughts and feelings. Maquinit has different levels of temperature in its three available saltwater hot spring pools. Stay where you can tolerate the temperature, else you can end up like a hard-boiled egg. Horrible joke! 😂 But there’s really a section that is too hot and untolerable even if you stay only for a few seconds — might leave a skin burn. Maquinit Hot Spring. Coron, Palawan. Maquinit Hot Spring. Footbridge Viewpoint. Climb 724 steps to reach Mt. Tapyas. Go sweat out and revel in the picturesque view of the town and its surrounding islets. View halfway to the top of Mt. Tapyas. Stunning karst limestones are everywhere! Karst rock formations are one of Coron’s unique features. There are mountain ranges of it—a clustered group of verdant limestone hills. During our entire stay in Coron, we took too many pictures because it felt like everything is worthy to capture. I bet you will also find it irresistible to have a picture of yourself taken on the view deck in Kayangan Lake with a panorama of limestone islets with trees embracing the cliffs. When we went snorkeling in Malcapuya, it reminded me of a scene I’ve read from a book when the characters went snorkeling: witnessing a school of jackfish; a silver fish staring at you; fishes bluer than blue. Plus it was wonderful to see corals breathing, cats in an uninhabited island, a constellation of sea stars, baby sting ray hiding under the sand, and shipwrecks. Back home, I went to grab that book again and yes, it looked like the author perfectly painted in words what we experienced. Witnessing the horizon fading during our boat ride was dreamlike. It seems surreal. Suddenly the sky turned hazy with light rain showers. The line where the sky meets the ocean was eventually covered with mist and the only noticeable was the bright blue kayak with a man paddling. Everything else around us was cloudy and ocean blue. Turns out the rain did not spoil our fun, but made it more amazing! Here’s our actual itinerary with a few notes. Back then there was no direct flight from Cebu to Coron; we had to take a connecting flight to Manila to reach Busuanga Airport. 19:00 To Dive Link Resort by boat for dinner. Enjoyed a sumptous meal. Super love the crab meat. 23:00 Back to the Villa. 11:30 Twin Peaks. Colorful corals and fishes in crystal clear waters. 16:00 CYC Beach. Missed the Coral Garden which is supposedly part of the day tour. The weather was not good, it was rainy and windy that time. 16:45 ETA Port. We did stop by and bought food (bangus and veggies) at the market to cook at the villa’s kitchen. You need to have a grocery net/bag because they don’t use plastic bags. Impressive, the local gov’t put in a lot of effort in their waste mgt. program. 18:00 ETD Maquinit Hot Spring. Walk through the wooden footbridge to get a beautiful and serene view of calm briny waters and surrounding mangroves. 09:00 ETA Malcapuya Island. Saw a baby stingray hiding under the sand. 12:00 Banana Beach. This is a great place to swim around with powdery white sands. 15:00 Some stopovers to snorkel or go fishing (my fiend has a fishing gear). 17:00 Coron Town Tour by renting a tricycle. Stop over at the cashew factory and souvenir shops. 10:30 Skeleton Shipwreck. Fish Feeding. Awesomest snorkeling site for colorful fishes. 12:00 Coral Gardens. We stayed longest here. Our guide Ed and Kae enjoyed hunting for clam meat. 13:00 Paz Island. Found 6 cute starfish cocoons here. 15:30 Lusong Shipwreck. Last Stop. We didn’t stay long. It was too deep, too dark underwater for snorkeling (and we must have been too tired by this time). 11:00 Airport Transfer. Joined a tourist family. 13:55 Flight Delayed. ETD Busuanga. 18:15 ETA Cebu. Home Sweet Home. 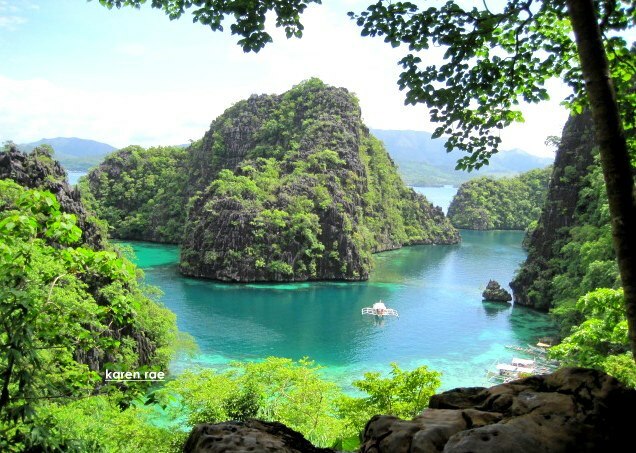 *The year 2012 was the best travel year to date and the trip to Coron was the most fascinating. Without minding the fact that I wrongly booked a flight date for a friend, this trip was the best. Thanks Kayi, Cielo and Rans for the photos and for the awesome company. Pingback: El Nido Paradiso | Digesting Healthy Thoughts.